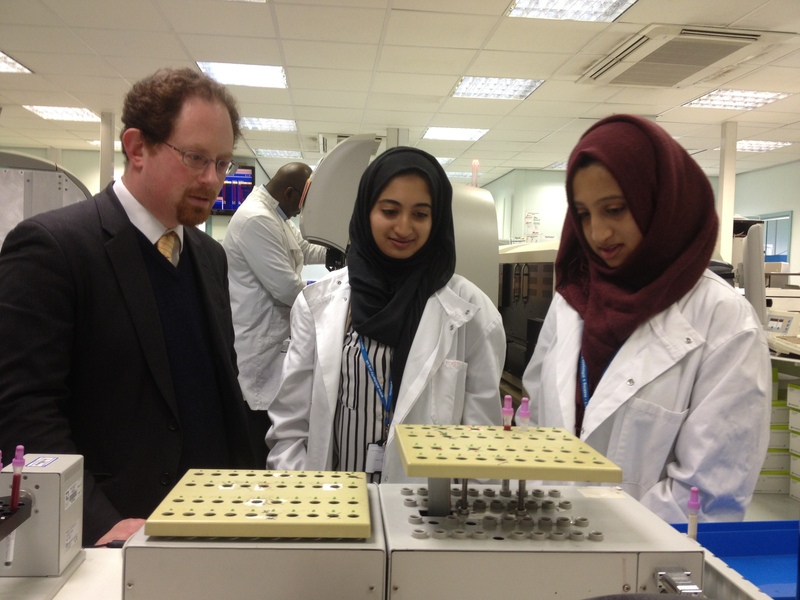 Twins Suhaylah and Yasmin Bhatti have taken the same apprenticeships and they invited MP Julian Huppert back to the science lab today (Monday, February 17) to find out more. The 19-year-olds are working at the city’s Addenbrooke’s Hospital through one-year science apprenticeships with Cambridge Regional College. They both studied A levels at Cambridge’s Long Road Sixth Form College and now combine working in the laboratories with a day of theory and practical work at CRC. Julian visited the pair from Cambridge to find out more about their work as part of his monthly initiative Celebrating Apprenticeships which aims to highlight the apprenticeships available in the city and the young people learning new skills. Suhaylah said: “I applied for university to study child nursing but it was very competitive and there weren’t enough places. Doing an apprenticeship gives me an insight into all the different jobs that are available in health care. It also teaches me practical science – employers look at how much training you’ve done, as well as your qualifications. They like to know you have the right skills. And Yasmin added: “The good thing about the scheme is that you can earn and learn at the same time. “While studying at sixth form I volunteered at Addenbrooke’s as a ward helper to have some experience into what it’s like working in a hospital and with patient contact. I really enjoyed it so I decided to apply for jobs within Addenbrooke’s and came across the science apprenticeship. “Since I have started my course, I have loved working in the lab and how well trained I have been. As one of my interests, I have always wanted to have experience working in the science field. Julian said: “It was great to meet the twins and see how enthusiastic they are about the work they do. This apprenticeship is a great way for them to learn on the job, and get some idea of the work taking place at Addenbrooke’s and the jobs available in the wider field of science. Cambridge Regional College has also joined forces with the Cambridge News and launched the 125 Apprentices – 125 Years Campaign to celebrate the 125th anniversary of the paper.